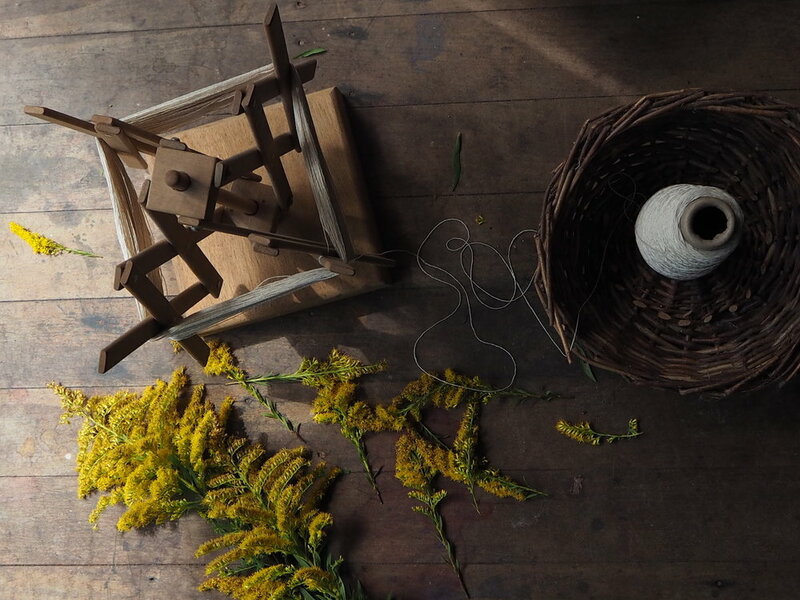 One of my all-time favourite local weeds to dye with is golden rod, solidago. Which is funny cause yellow isn't usually my colour, but the brilliance of golden rod in the dye pot is enough to entice anyone towards to sunny disposition of life. Each year I wait, with an eager patience & delightful anticipation, for the flowers to grow and bloom. 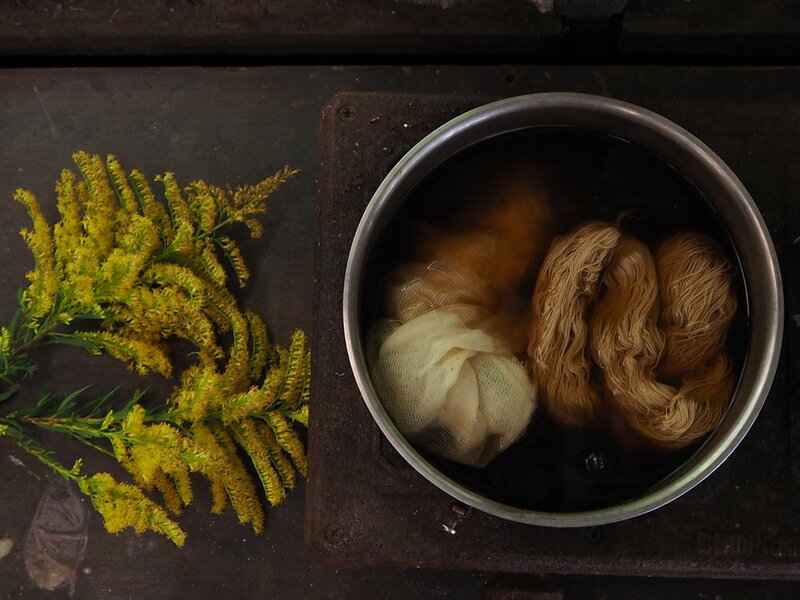 Dyeing in this manner, as things are in season, is for me one of the joys of natural dyeing - watching the landscape around me and waiting for things to be in their prime. The first workshop I picked these for, quite a few years ago, was in Brisbane. My family and I cut stalk after stalk of the showy stalks and loaded them into the car with all the other workshop supplies, alongside three kids and their luggage too. Little did we know that the flowers were filled with teeny tiny greeny-white spiders, that over the course of the drive overtook our car! It took quite a long time for my family to forgive me, and they still remind me to this day. 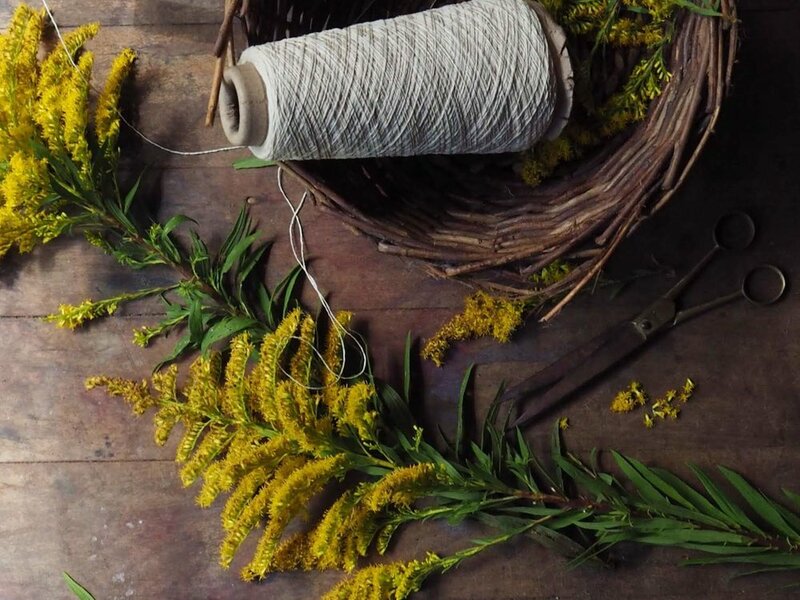 If you buy golden rod from a local florist or the flower market I'm sure it's been grown commercially and isn't covered in little bugs, but every time I pick the flowers now I make sure to give enough time for the spiders and grubs to crawl off before I load up the car! Golden rod is a weed in our country, and I've noticed it growing along fencelines where the farmers can't mow them down. They die back after their flowering season, and grow up again each year. They're often used a filler in flower bouquets, so you can get them from a florist or ask your local garden centre to get a bunch in for you. You need to pre-mordant your fabric with your desired mordanting technique. I used to use alum, but nowadays I'm moving towards no mordants at all, and allowing the colours to shine themselves through longer dyeing time. Though, alum does often make dye colour brighter, so do keep this in mind. I've noticed also that alum brightens dye colours more than soy mordanting does - from my experience. But the beauty of golden rod is that a whole lot of flowers make a brilliant colour on their own. *also remember that alum, if not used correctly, can colour shift yellows towards the green spectrum. If you use the flowers when they're still closed, in bud form, you'll get more of a green-chartruese hue, whereas if you pick (or use) the fully opened blooms you'll get more of a clearer brilliant yellow. Don't use any leaves in the dye pot, only flowers. Fill a saucepan with as many flowers as you have - separate the buds from the open blooms into two dye pots for different tones of colour. Cover with water and gently simmer to extract the colour. Don't boil your dye pot, but allow it to come to heat slowly, until just before simmering. Leave it at this point for about 15 minutes or so, and then turn the heat off and allow to cool. Check the colour - if you think you've extracted as much from the flowers as possible strain the coloured dye water into another saucepan or bucket. If the flowers still have some colour left in them you can do a second dye bath, but it will be much paler. Put the dye water back into your saucepan and add your pre-mordanted fabric. Remember that fabric and yarn doesn't want to be plunged into boiling water as it can felt wool, make silk loose it's shimmer, and affects cotton slightly too. Bring the saucepan back up to just-under-simmer point and leave there for about half an hour. Watch the colour on your fabric. If you're happy with the depth of colour you can remove it from the dye pot, or otherwise turn the heat off and leave the fabric in the pot to cool. Allow the fabric to dry fully before washing it out. In our climate two days in the shade is good for 'curing', but you might find you need a little longer. Then gently wash, with a ph-neutral soap (or I use no soap) until the water runs clear. Hopefully you won't have much run-off if you've left the drying stage for long enough. How to determine what colour you want when the fabric's wet? This can be hard, and takes practice to recognise, but think about when you do your washing and the clothes are darker when they're wet. Silks keep their colour a lot more, whereas cottons can be up to half the depth of colour from the wet stage. So, I always err on making my colours stronger than I think I want, rather than paler. 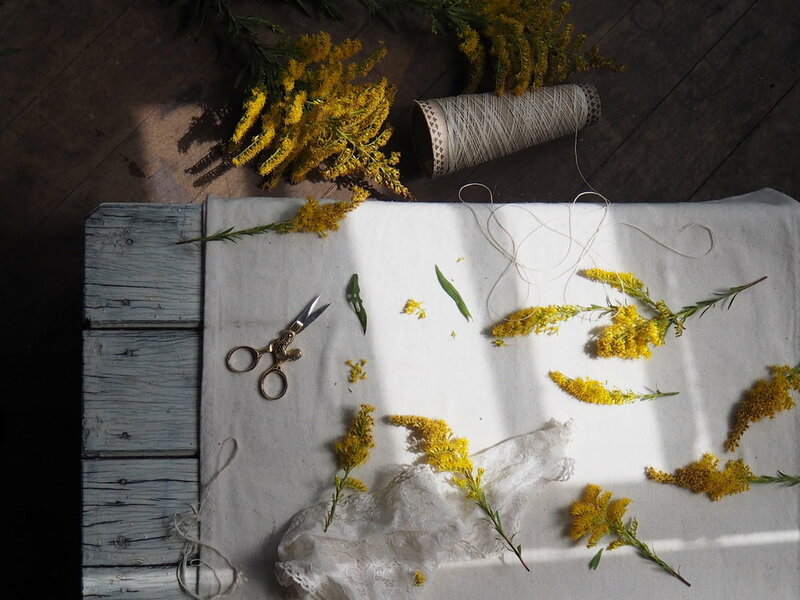 You can find out more about Natural & Botanical dyeing through my online course here, or follow along my Dye Diaries here.